The RV Doctor: What? No P-Trap in the RV? What? No P-Trap in the RV? Welcome Craig, to a new type of waterless P-trap. Actually, it’s best described as a waterless sanitary waste valve. I've mentioned this device in previous posts and they're being found on more RVs directly from the factory. 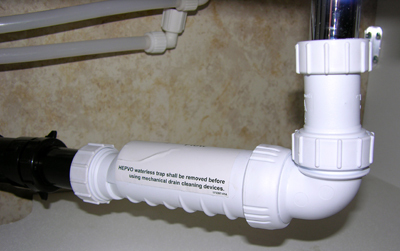 It's called the HepvO valve, and it eliminates the need for a bulky P-trap hanging down below RV sinks or below a shower/tub enclosure. During manufacture, this maximizes the ceiling height in the shower area so there's no need to have that bubble skylight in the roof any more since the pan can be installed directly on the floor with the drain plumbing below. In the aftermarket, the HepvO valve will provide owners more under-counter storage space. 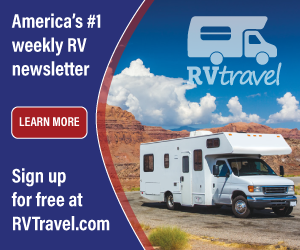 Additionally, it does not require RV anti-freeze during winter prepping, or any maintenance for that matter. 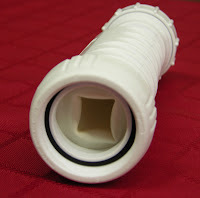 The HepvO’s unique design incorporates a flexible, self-sealing, internal silicone membrane that opens when water is flowing and completely closes off when the flow stops to prevent holding tank odors from escaping up and through the fixtures. Because it is in itself, an effective air-admittance device, this new valve even eliminates the need for additional anti-siphon trap vent devices (ASTVD) at fixture trap arms; another cost-saving manufacturing advantage that should eventually filter its way to the RV buyer. It can be installed either horizontally or vertically, thereby maximizing installation options. This new design also has proven to be hygienically safer since waterborne food particles and debris cannot become trapped inside or given a chance to develop microbiological and bacterial growth. The HepvO cannot be rendered ineffective by freezing temperatures, siphoning, evaporation, water compression, foaming, capillary action or by any disproportionate physical movement of the motorhome; all possible outcomes common to a standard water lock P-trap. All in all, a neat new, space-saving method of preventing holding tank odors from entering the RV, even during periods of non-use, winterization and storage. Already factory-installed by many coach manufacturers, the HepvO waterless valve will be gaining new aficionados from the aftermarket in the coming months. By virtue of its inimitable design and proven track record in the United Kingdom, it’s unlikely you’ll ever have grey plumbing odor issues again.